An investment promotion delegation led by Minister of Enterprise Development, Investment Promotion, Mass Media and Information Anura Priyadharshana Yapa, has concluded a successful program in Thailand and Singapore. The visit from June 22 to 26 was organized by the Board of Investment (BOI) in co-ordination with the Sri Lankan Embassies in Thailand and Singapore and received tremendous interest from potential investors. The highlight of the program in Thailand was an Investment Forum, Emerging Peace and Business Opportunities in Sri Lanka, organized by the Thai-Sri Lanka Chamber of Commerce. More than 125 companies attended the seminar, double the number initially expected by the organizers. Delivering the keynote address, Minister Yapa said Sri Lanka is today one of the safest countries in the world for investment. “We are one of the few countries in the world to have eliminated terrorism and now the government is focused on rapid economic development of the whole country,” Minister Yapa said. The minister said the Sri Lankan economy is set for a long period of dynamic growth and encouraged Thai investors to make the best use of investment opportunities. He urged investors from Thailand to discover Sri Lanka, noting that the country trailed Malaysia and Singapore in investments. Minister Yapa said the government was keen to attract investments to the newly liberated North and East of the country with tax-free incentives being offered up to 15 years. Sri Lanka’s Ambassador to Thailand, Prof J.B. Disanayaka noted the strong links between Thailand and Sri Lanka and invited investors to make use of the positive business climate in the island. Thailand’s Ambassador to Sri Lanka, Thinakorn Kanasuta, who made a special visit to Bangkok to be present at the business forum, gave an upbeat assessment of the investment climate in Sri Lanka after the defeat of the LTTE. Executive Director (Investment Promotion) of the BOI, Duminda Ariyasinghe said investors can make use of Sri Lanka’s preferential trading agreements with India, Pakistan and the EU to target a large market. The Minister also met Thai companies interested in investing in Sri Lanka, including one of the largest construction companies that played a central role in the construction of the new Suvarnabhumi airport and the allied highways. Two investment delegations from Thailand are expected in Colombo in the coming months, as a follow-up to the Minister’s visit. A 21-member investment and business delegation led by the by the President of the Sri Lanka-Thailand Business Council, Lionel Fernando accompanied the Minister and held one-to-one meetings with Thai counterparts on sectors such as IT/BPO, Gems and Jewellery, Agro and Food Processing, Tourism, Infrastructure and Manufacturing/rubber-based industries. The meetings were co-ordinated by President, Thai-Sri Lanka Chamber of Commerce Suresh Ellawala, the Board of Investment of Sri Lanka and the Sri Lankan embassy in Thailand. Minister Yapa also met Thailand’s Vice-Minister for Foreign Affairs Panich Vikitsreth who oversees investments. Minister Vikitsreth said the Thai government was encouraging companies to invest overseas, making use of ample liquidity in Thai banks. Minister Yapa also delivered the keynote addresses at two investment forums in Singapore organized by the BOI and the High Commission in Singapore in co-ordination with International Enterprise (the government agency spearheading Singapore’s external economics, including investments) and the Singapore Business Federation (SBF). Sri Lanka’s Ambassador to Singapore, Jayathri Samarakone said Sri Lanka offers some of the highest rates of return for investors in Asia. Noting the presence of Singapore stalwarts such as the Shin Kwan Group and the Prima Group in Sri Lanka for over two decades, the High Commissioner encouraged investors to make use of emerging growth opportunities after the war. Deputy Director General (Investment and Promotion) of the BOI A.M.C. 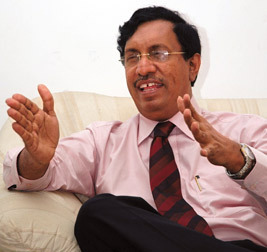 Kulasekera, said more than 70 per cent of FDIs into Sri Lanka were in the form of reinvestments, indicating the high level of satisfaction among existing investors in the country. Prior to the forum, the Minister met Deputy CEO of IE Singapore Chua Tail Him, who said the city state would be willing to share its expertise in production, processing and transporting of agro-based products with Sri Lanka through new investments. Minister Yapa noted large areas of land available in the North and East could be utilized for agro projects. Him also said Singapore would be interested in establishing an IT and BPO Park in Sri Lanka. Among the CEOs who met the Minister were a large conglomerate with interest in hospitality, mining and real estate and the Asian head of a large US-based consumer products company that is finalizing its investment plans in Sri Lanka to target the South Asian market. A 12-member investment delegation led by President of the Singapore-Sri Lanka Business Council in Colombo Shamil Mendis, held meetings with counterparts including potential joint venture partners. The meetings were coordinated by Minister Commercial at the High Commission Bandula Somasiri, and Senior Manager responsible for Southeast Asia at the BOI Shantha Jayasinghe,. Minister Yapa held a meeting with Singapore’s Minister for Trade and Investment Lim Hng Kiang to discuss the expansion of investments from Singapore to Sri Lanka. The Singapore Minister expressed his government’s willingness to fast track negotiations for a Free Trade Agreement between Sri Lanka and Singapore. Minister Yapa also met the President of the Singapore Jewellery Association, Charles Ho Nai and senior executives. Associating at the meetings were Chairman, National Gem and Jewellery Authority, Hasitha Tillekeratne and Manager (Exports) of the authority Rohan Pitigala,. Minister Yapa’s investment promotion missions to Thailand and Singapore organized by the Board of Investment of Sri Lanka gained significant media interest with extensive coverage including the prestigious Bangkok Post, the Asian Tribune and the Bernama news agency.